Master Microsoft’s new hybrid operating system easily and painlessly with our Windows 8 Superguide digital download! $10 – Click here to buy now with Clickbank. 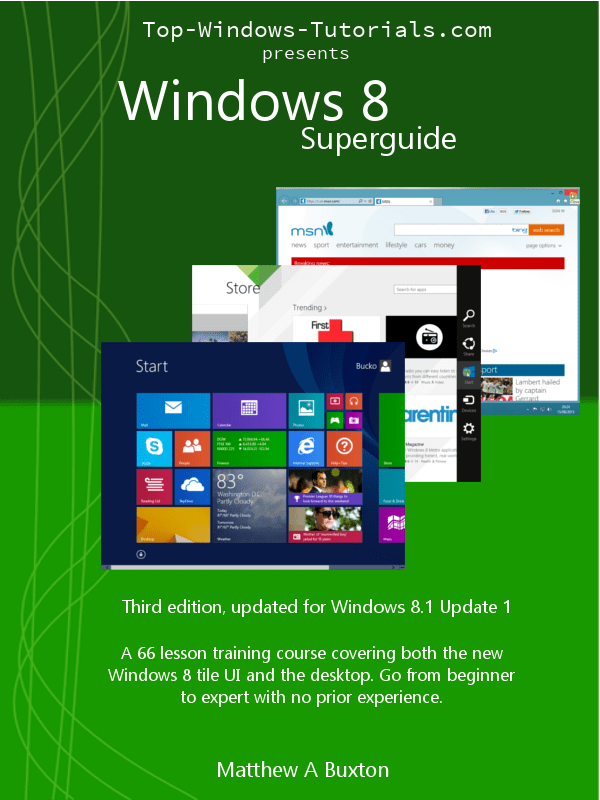 The Windows 8 Superguide is the latest in our successful range of Superguide training courses. These guides are designed to offer training courses for those of you who want to master a certain topic or application. You can read more about the Superguides by clicking here. Now fully updated and revised for Windows 8.1 Update 1, the Windows 8 Superguide is better than ever. Windows 8 is here in a flurry of controversy! The new operating system is the most radical departure since Windows 95. In this guide, we cover the entire spectrum of Windows 8, from the touch optimized tiles to the productivity power-house of the desktop. Thanks to this Superguide, learning this new operating system just got a whole lot easier. Whether you are new to computers entirely or just new to Windows 8, this Superguide will help you to get the most out of the operating system, no matter what kind of PC you are using. The guide contains no less than 66 lessons and 63 video tutorials (each provided in three different resolutions to suit a wide range of monitors) as well as printable lesson notes and worksheets. The Windows 8 Superguide is endorsed by The Federation of SeniorNet Societies New Zealand for use in its 90 learning centres across New Zealand. We are proud to support SeniorNet New Zealand with our best selling Windows 8 Superguide and delighted to show their endorsement of it. All the videos included in our Windows 8 basics section are included in the Superguide in super high resolutions and with improved audio quality. For those of you who need help with your basic computer skills, we have also included the best beginner tutorials from Top-Windows-Tutorials.com. Unleash the true potential of your new Windows 8 machine, be it tablet, hybrid, laptop or desktop, with the Windows 8 Superguide. There is no better beginners course available anywhere! The download comes in two parts, you should download each part and back them up immediately. The digital download version is priced at $10 US Dollars and of course you pay no postage or delivery charges. Use the button below to buy the Windows 8 Superguide digital download through Clickbank. Your payment details will be secured using their SSL encrypted server. Remember that with this service you will receive a download link only, you will not receive a physical product. Note that your credit card will show a transaction from Clickbank, not Top-Windows-Tutorials. Windows and Windows 8 are registered trademarks of Microsoft Corporation. This site and the products and services offered on this site are not associated, affiliated, endorsed, or sponsored by Microsoft, nor have they been reviewed tested or certified by Microsoft. Customers can now submit their own reviews for the Windows 8 Superguide. We welcome any feedback, good or bad! If you have purchased the Windows 8 Superguide and would like to leave a review for other customers to read, please click on the “Create your own review” button below. We will publish all genuine reviews and moderate for offensive language/content only. Benefits A Beginner of Windows 8 Greatly! This book is a MUST HAVE book for a new Windows 8 user! Note - This review was published on Amazon.com for the Kindle e-book version. All the e-book content and much more is included in the DVD/Digital download Superguide, of course. This book in my opinion is a MUST HAVE book if you are new to Windows 8. 1) There are 12 chapters in this book and each chapter has several very useful lessons in them. There is a total of 65 lessons in this book and each lesson has a picture or pictures that are large enough to visually see what to do in the lesson. Also, each lesson is very easy to follow and understand as every lesson is explained superbly! *What I love about the lessons is that it is like having a caring teacher sitting next to me showing me how to complete different tasks in Windows 8. 2) This book covers many things especially in the first part of the book where the authors show you how this book will benefit you in Windows 8. This is a complete textbook and reference book. 3) Each CHAPTER with lessons is in the exact order of the step by steps you will need to get you up and running and learning Windows 8. For example, Chapter ONE covers starting your computer for the first time in Windows 8 and how to personalize your computer, how to set up the computer, sign up for Microsoft Account, Lock Screen, Start Screen, Login screen. All of this is shown with actual pictures of what your screen will look like complete with step by step info on how to use this task. *Windows Key + D will bring you right onto the Desktop (yes, it will look so comforting, kind of like the Windows 7 Desktop but with no Start Button). On the Desktop you can create shortcuts to your favorite applications. And for me, I placed MS Word, Excel, PowerPoint, Foxfire, and more---no more hunting in those tiles to find a program! * Windows Key + C. This brings you to the Charms menu where you can: Power Off your computer, Search, Settings, Devices, Start. (The Charms menu does so many things as the SETTINGS (on the bottom, the cog looking wheel) has many settings and you will find Control Panel (you will use this often), shows how many bars you have on the Internet and if the Internet is connected, speaker setting for sound, and other useful personal settings for your computer. The BEST thing is that this is where your Power Button is located (to turn off the computer), this is located on the bottom of the bottom center and it will let you select: Sleep, Shutdown or Restart. 4) Every chapter in this book is full of helpful information that I have found has helped me greatly. This book is a superb reference book, one that I plan to read whenever I need to look something up, it already has led me to use Windows 8 effectively. I have been using Microsoft products since before the original Windows was released and I find Windows 8 to be the best version yet. Of course there is a somewhat big learning curve, but that is to be expected when a completely different software version comes along. I will admit that I was stumped by several features and tried using various help sites and books. I have found, however, that the Windows 8 Superguide is the best teaching software available. I have tried other tutorials, but this one offers the most information in a very easy to digest, interesting, and colorful form. I highly recommend this product.